Grooming: Where Dogs Come to Look Good! Caring for your dog’s coat is important to us as we believe a well-cared for dog is a happy dog! 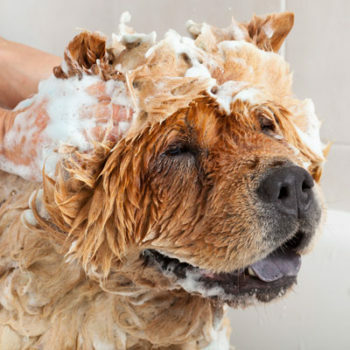 Our Groomer has been trained by an internationally recognised Master Groomer and is happy to share her knowledge as well as give practical advice on brushing, drying, maintaining the coat and the best equipment to buy for grooming your dog. Our Groomer uses professional, quality equipment which is carefully maintained, sterilised, and cleaned. We take a real interest in getting puppies started the right way in life, including grooming. We encourage puppy owners to book their fur baby for a day with us to desensitise them to the various grooming equipment they may be exposed to, as well as our environment. It’s also a great way for them to get used to being handled by different people. We groom all breeds and all ages, long haired and short haired. Regular grooming is important when maintaining a healthy, knot free coat. So let us help you keep your dog’s coat looking good! – A copy of your dog’s vaccination certificate, vet details and an emergency contact, is required at the initial booking. – For grooming we will need your fur baby at our Canine Complex by 8am. For Pick up our Groomer can either arrange a suitable time or she can call you once the groom is finished. – If you prefer your dog to have a full day’s experience then you are welcome to book your dog in for daycare before being groomed. – If coming out to us is an issue, then we can pick your dog up in our K9 shuttle and drop your dog home in the afternoon. – Please give us plenty of notice if you wish to cancel your dog’s appointment as this allows us to fit in any late bookings.